TRAP DESCRIPTION: 16" Wide x 10" Tall x 24" Long. Latest design for starling or sparrow trapping. It has two holding areas or compartments. The first or main lobby is accessible by 2 "funnel" doors. The second compartment can only be entered by passing through a another funnel door which leads from inside the main lobby. These funnel doors work by allowing target birds to "squeeze" in comfortably but when they attempt to reverse their path and try to leave they find the funnel uncomfortable. Rather then risk hurting themselves, most will choose to simply stay in the trap. These entrances are adjustable so if needed you can make them smaller or larger. This ability to adjust the funnel opening enables the trapper to then target birds of two sizes or even different species. You'll need to bait both compartments so that there is a reason for the sparrows to forage over to the second compartment. Remember, both compartments have sliding doors used to bait and/or remove birds. 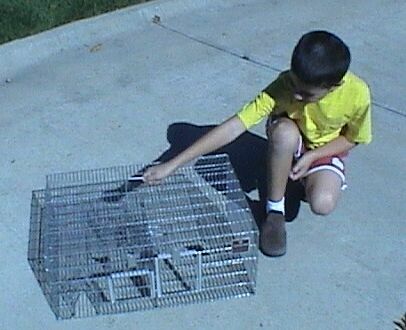 This setup will work for other species of birds as well and is one of the reasons why this trap is both unique and ideal for when a variety of nuisance birds are active. OTHER USES: You can also "hang" this trap on the side of buildings and use it to capture nesting birds like woodpeckers who commonly peck holes into exterior voids. For this setup, you'll need to put 2-3 screws into the structures siding to hold this trap in place. These screws should be 2-3 inches above the woodpeckers exit hole. Next, you'll need to align this trap so its entrance way is directly over these exit holes. Once in place, any woodpeckers trying to leave their nest will be funneled into this trap and captured alive. 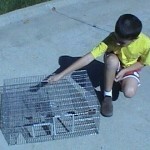 RATE OF APPLICATION: One trap can catch 15 – 30 birds per set.